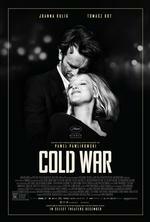 "COLD WAR is a near-perfect film, an artfully crafted, flawlessly acted meditation on love, memory and invented history that's both deeply personal and politically attuned." "Cinematographer Lukasz Zal finds a chilly, etched beauty in every frame; you're struck by how snow seems to stroke and soften a harsh landscape, and by the poignancy of wind ruffling the grass in a quiet field." "Through COLD WAR, Pawlikowski shows us the beauty in an ugly time, and then he makes us wait and wonder if the characters will ever see it, too." "Passionate, tempestuous, haunting and assured, this latest from writer-director Pawel Pawlikowski explores, as did his Oscar-winning "Ida," Poland's recent past, resulting in a potent emotional story with political overtones that plays impeccably today."